steadiest, best-selling comic books on the stands. It starred characters that were recognizable at a glance, by Americans of all ages. But when DC licensed its most famous team to Hanna-Barbera for an animated show on Saturday mornings, it was heavily altered. Maybe that's because it was a time when networks were trying to appease parent action groups by emphasizing so-called positive values like sharing, giving and friendship, rather than the sort of bashing that superheroes are better known for. Or maybe it's because the Justice League as it stood didn't have any kids or dogs in it. Whatever the reason, The Super Friends, as the group was re-named for television, was very different from the version comic book readers were familiar with. Lesser characters, such as Hawkman and Green Arrow — as well as some majors, like The Flash and Green Lantern — were jettisoned in favor of Marvin and Wendy, who were training to become superheroes, and their pet, Wonder Dog. The experienced heroes who did make it in were Superman, Aquaman, Wonder Woman, Batman and Robin. The show debuted September 8, 1973 on ABC. 16 hour-long episodes were made, and they were run repeatedly over a two-year period. Superman's voice was done by Danny Dark (also known for NBC network promos and Keebler cookie commercials). Aquaman was Norman Alden (Sir Kay in Disney's The Sword in the Stone). Wonder Woman was Shannon Farnon (Kim in Valley of the Dinosaurs). Batman was Olan Soule (reprising his role from Batman's own animated show). Robin was Casey Kasem (Shaggy in Scooby-Doo). Wendy was Sherry Alberoni (who started out as a Mouseketeer on The Mickey Mouse Club). Marvin was Frank Welker (Foofur), who also spoke for Wonder Dog. The narrator was Ted Knight (who also worked on the cartoon version of The Fantastic Four). Incidentally, this was the first animated production in which Superman's voice was done by anyone other than Bud Collyer, who had died in 1969. Collyer was the original voice of Superman, not just in the Fleischer/Famous Studios cartoons of the 1940s, but also on radio. The show went back into production in 1977 under the title The All-New Super Friends Hour. The kid and dog characters were switched out for The Wonder Twins, a pair of super-powered aliens named Zan (voiced by Michael Bell, who also does Drew and Chas in Rugrats) and Jayna (Liberty Williams, who is better known for face acting than voice work), and their pet, Gleek, who resembled a blue-skinned monkey. In this incarnation, other DC characters occasionally guest-starred, and a few new heroes, not seen in the comic books were introduced. 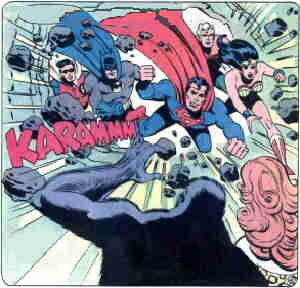 It was back again in 1978 as Challenge of the Super Friends, this time in a half-hour format, with William Callaway (Ming the Merciless in Defenders of the Earth) replacing Alden as Aquaman; again in 1979, as The World's Greatest Super Friends; again in 1984 as Super Friends: The Legendary Super Powers Show (with Adam West reprising his 1960s role as Batman and Firestorm (voiced by Mark Taylor, also heard in Darkwing Duck and The Twisted Adventures of Felix the Cat) added as a new member); and one more time in 1985, as The Super Powers Team: Galactic Guardians (no relation). Despite the proliferation of titles, only about 60 episodes were made altogether, divided about evenly between half and full hours. Tho there was the usual merchandising — lunch boxes, toys, etc. — DC didn't do a separate comic book version for the first three years. Instead, it simply added a blurb to the covers of its regular Justice League of America title, tying it in with the show. It finally launched a Super Friends title with a November, 1976 cover date. This was drawn in a more open, cartoony style than most DC comics, and written for a younger audience. The writer and artist most closely associated with the comic book Super Friends are E. Nelson Bridwell (The Inferior Five,) and Ramona Fradon (Metamorpho). It started out as the original version, with Wendy, Marvin and Wonder Dog, but added Zan, Jayna and Gleek to the cast with #7 (October, 1977). It lasted 47 issues, the final one dated August, 1981. Aside from being among the few superhero comics aimed at younger readers, this title was notable for introducing The Global Guardians, an international group of costumed do-gooders, to the DC Universe. Nowadays, a less-altered version of The Justice League of America can be seen regularly on TV. Still, The Super Friends turn up as reruns from time to time.